Jones envisions transforming Wynkoop Street between 16th and 18th into “Wynkoop Square” by making those blocks car-free. If that seems like a radical idea, he says, just test it out first with inexpensive, temporary materials. “I would be willing to bet that within minutes of cones going up, pedestrians would completely take over the street,” Jones says. That’s exactly what happened when New York pedestrianized Broadway at Times Square and Herald Square. The initial “plazas” weren’t much more than some lawn chairs and orange construction barrels to keep cars out, though nicer surfacing and street furniture were quickly added. Some serious thought also went into programming events on the plazas. After monitoring the effect of the new street design for several months, the city decided to move ahead with a permanent construction project. Wynkoop already has many of the hallmarks of a great plaza, Jones says. It’s the right size — big enough to host public events but small enough to see your friends from anywhere in the square. The buildings are tall enough to create a sense of enclosure, but short enough to let sunlight in. Shops, restaurants, and outdoor seating along the street and at the existing Wynkoop Plaza set the stage for street life and activity. A people-friendly redesign of Wynkoop is on the city’s radar, but it currently appears to be years away. Community Planning and Development has floated the idea of turning it into a woonerf, a street where motor vehicles are allowed but pedestrians clearly take precedence. Wynkoop was never meant to be the kiss-and-ride it has become — planners originally envisioned Wewatta Street, behind the station, in that role. Why not test the car-free idea with low-cost materials this summer? 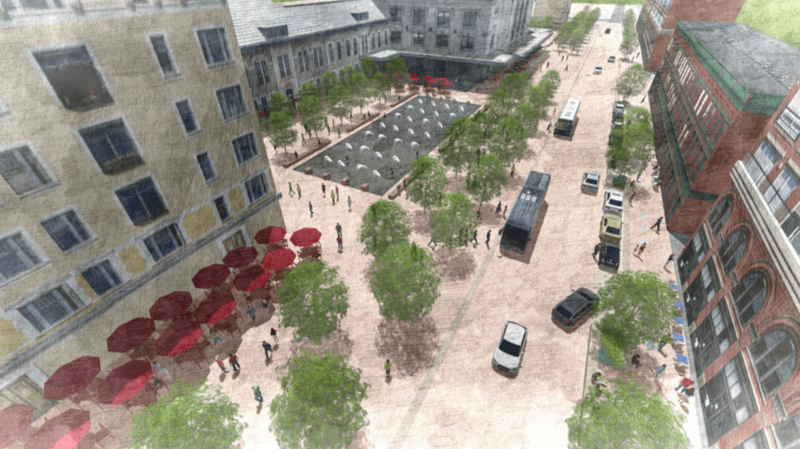 Wynkoop Plaza could become an iconic public space for Denver. Makes too much sense. I do not see the advantage of the woonerf. Edit: I missed the post about the insane bollard placements. Wow. Please make this happen, it’s an excellent idea. I would love to be kept abreast of any progress. It would also be really cool for the pilot period to do some interesting stuff with tactical urbanism in the newly available space. Yes, yes and yes! It’s this type of “out of the box” thinking that makes a potentially great urban space (and city) into a reality. Need more of this in Denver. Thanks to Chris Jones (and Streetsblog Denver) for the excellent post. The people want Wynkoop to be the kiss-and-ride street, and it’s only natural, given where the station is. Accept it. Redesign the street to BE a kiss-and-ride. One travel lane, one “drop-off/pick-up/loading” driver-stay-in-your-car lane, ZERO parking lanes. If you do that, there’s plenty of room left to have a two-way protected bike lane and a sidewalk between that at the car travel lanes. P.S. If you pedestrianize Wynkoop, 17th Street becomes the kiss-and-ride location. (Which I think would be worse, as it interferes with access to alleyways.) People will head for the closest point to the front of the station. Accept it, plan for it. Wewatta should be the kiss and ride street. Remember when trains used to run on Wynkoop serving the warehouses down by the Terminal Annex? Just back in the 1980s. Of course if you won’t let me drive on Wynkoop that will be one less place I can drive to, as I really don’t walk very far at my age and weight. I feel that closing roads is discriminatory against those who are not physically fit enough to walk very far. Disability absolutely should be a consideration when designing public spaces, but most people drive automobiles because they’re lazy, and cars are convenient. We need to make it easier and more accessible for public transportation rather than cars. There will only be more people on the planet. We need to be sensible about space. Let’s be realistic about the future.